Loving these dupes! I've never tried a BYS lipstick before, but the swatches of this one look great! I'm a huge sucker for packaging especially what YSL has to offer. Thanks for this! Nothing beats the luxe YSL packaging but the Rimmel one is identical and only a fifth of the price. Hope you like it! Wow, what great dupes! They are so similar! Will grab the Rimmel dupe! Great post! Thanks for sharing these dupes! Great post!! I'll definitely be looking for the Rimmel lipstick the next time I'm out shopping. Great dupes! My pick would be the Rimmel I think they make fantastic lippies for the price although I do own that YSL (which I never use) I really should as its a waste it stiing there. Haha! I've got Sassy Salmon and Pink Blush too - obviously I can live without the YSL version then!!! they are like literally identical, that's amazing! I went out and picked up the Rimmel lipstick today and it is gorgeous!! I don't have the YSL lippie to compare it too but I am loving the color already! Thanks for this post! Wow! These are identical! Not only colour but finish of the lipstics looks the same too. Those are awesome dupes...I won't know which is which if you hadn't labelled it! 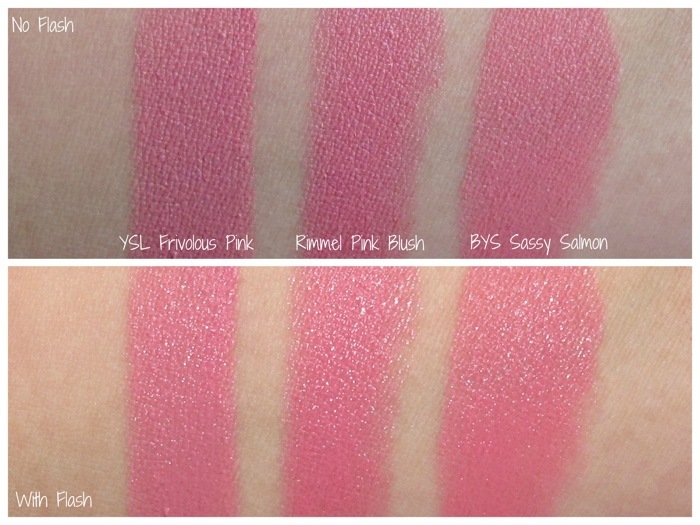 This is such a great post, I have a little left in my YSL Frivolous pink!! I love pink color.so cute. wow. thats amazing - they really are exactly alike swatched. Ooooh I will definitely have to check out Pink Blush!